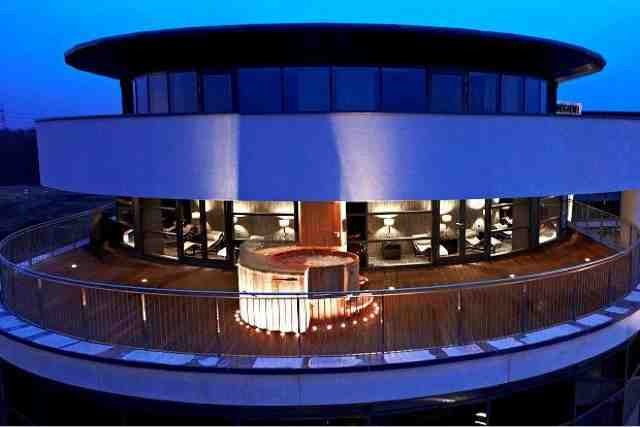 The other week my gorgeous friend Amanda celebrated her baby's first birthday, and for her part in the event we decided we needed a little treat for her too, so we headed to the 4* boutique Brooklands Hotel conveniently located near the M3/M25 junction for a spa day. 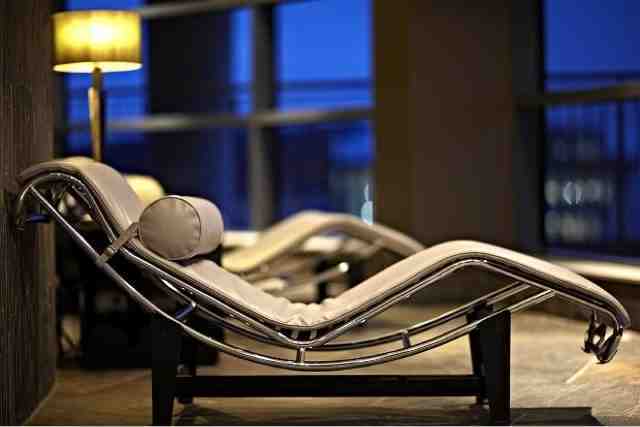 We chilled out in the stunning relaxation room looking out onto the Mercedes Benz Word race track (some where to send your other half if you need to busy them!) catching up and reading magazines whist we waited to be called through for our treatments. I opted for a Skin Calmer Facial using products by Lubatti (created by facialist Tracey Malone, sister of Jo Malone) which included a heavenly facial massage, leaving my skin feeling pampered and moisturised (£40/30 mins). Whilst Amanda went for the Jane Scrivne Peace and Relaxation massage (£38/25 mins) and returned looking rejuvenated and chilled out. Other treatments on offer include manicures and pedicures by Butter London and organic odourless tans by Beau Bronz. The wooden hot tub is ideally positioned on the huge roof terrace and one of the therapists even came out to bring us towels which we had forgotten in our excitement. To finish off our relaxation we popped into the Meditation Room to lounge on the gently heated waterbeds before heading for lunch. We went to the hotel's 1907 Resturant on the ground floor, but other Spa goes ate in the Spa's more casual reception area where robe and slippers are more acceptable attire! 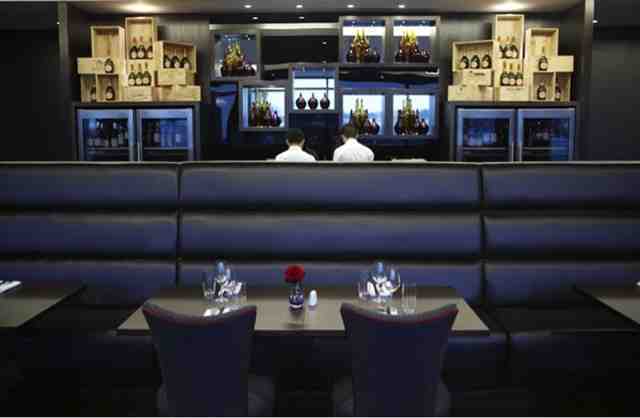 The food was yummy and the service superb, with a range of lighter meals to fine dining. 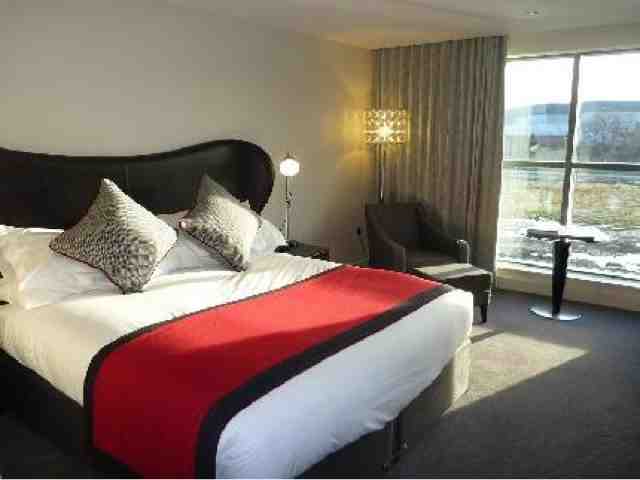 If you are coming from further afield, why not make a weekend of it staying in one of the hotel's gorgeous rooms (from £120 a night) where all beds come as kingsize as standard and are super modern and stylish with touches that remind you of the location's race-track history. My only disappointment was the lack of a swimming pool, which I was expecting as part of spa facilities (£25 for a non hotel guest) to compliment the other relaxation facilities, including sauna and steam room. With London Fashion Week almost over, photos of the stunning models on and off the catwalk are filling websites and magazines everywhere with their perfect complexions and beautifully applied make up. Catia, Anna, Brogan and Eline, the stunning M & P girls. So I headed to M and P Models, an Oxford Street Modelling agency last week to catch up with the girls on a casting to share with us their top tips for looking great for one of their most important weeks of the fashion calendar. Out side M&P, not looking quite as glam..! All the girls tell me getting enough sleep (after taking you make up off!) and drinking loads of water helps them to keep their skin blemish free and banishes puffy eyes and dark circles. 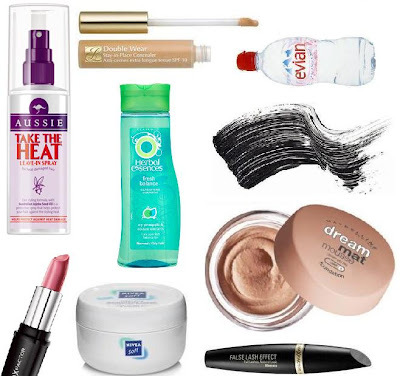 Although the girls admit that the temptation to party during fashion week can lead to them relying on Estee Lauder's Double Wear Stay-In-Place concealer teamed with Maybelline's Dream Matte Mousse, to hide the signs of fatigue. Mascara, unsurprisingly is high on the girl's must have list, Brogan favours Clarins Wonder Volume Mascara, Catia can't live without her Max Factor, Kersti loves Benefit's latest They're Real to give a wide-eyed look and Eline is a big fan of Volum' Express the Colossal Cat Eyes by Maybelline to get high-impact eyes. You may recognise the gorge Eline as she is currently hitting our TVs in the current Simple Kind To Skin Cleansing Facial Wipes. Along with the clothes, we've spotted some fabulous hair designs at the shows this year, but this straightening, teasing, blow drying and hair spraying must take its toll on the girls hair, so we ask how they keep it in its best condition. Catia keeps her locks clean and healthy by using Herbal Essences Fresh Balance range, containing Citrus blossom and Green tea extracts whilst Brogan makes sure she uses a heat protector spray, such as Aussie's Take The Heat to reduce the stress on her hair. 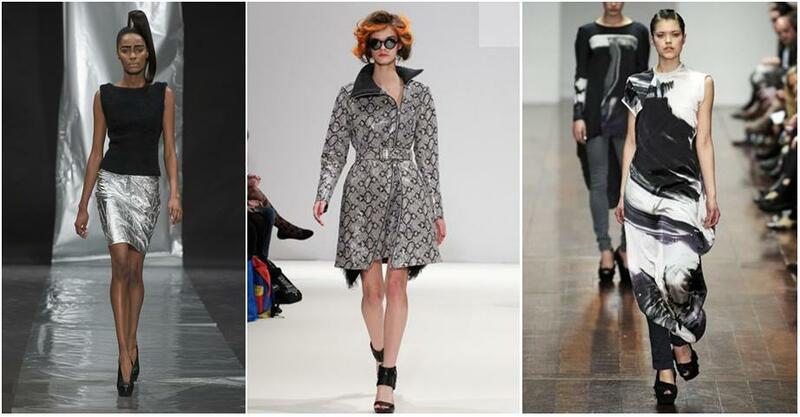 As all of you fashionistas will be well aware of, yesterday was the first day of London Fashion Week. This hit the press for other reasons than the stunning designs, as many of the big modelling agencies banning their models from using sun beds due to the massive increased risk of developing skin cancer. I spoke to leading agency M and P Models for their take on it. Head booker Russell Loughlan told me "M+P are always looking out for the models health and we will be announcing our commitment to ban all of our models from using sun beds. We will be urging our models to take a safer approach to tanning as their health and welfare are very important to us." Also speaking to some of the models on their books, they didn't use sun beds anyway, due to the risk of malignant melanoma and their effect on ageing the skin. Let's emulate this positive step and fake it ourselves. I've pulled together some of the latest offerings from the tanning industry. Higher up the price rung is Fake Bake's new Unisex Bronzing Gel Self Tan (£25/148ml) which also needs to be applied with gloves (provided). The tan isn't as intense as No More White Bits, but you can apply over consecutive days to build up to the desired shade. It looked really natural and doesn't have the typical fake-tan smell! Containing concentrated antioxidants Vitamin C and E it helps combat the free radicals that age skin prematurely. Whilst we are in the mood for love, I thought I'd share with you my latest find. I am OBSESSED with Jan Constantine's British Love designs, especially her cushions. However, with a price tag of around £50 are sadly out of my budget... However on a glamourous trip to Homebase I found this imitation which even has the cute blanket stitch around the edging, so I snapped it up for just under a tenner. I hope you all had a lovely valentines day, I had one of the best in years. Mainly because it is half term, so no work for me! Instead I went wedding dress shopping with the beautiful Victoria in London. After much coo-ing at the stunning dresses we popped into the luxe Langham hotel for a celebratory tipple before heading to the Oral B, Aussie and Herbal Essences Valentines Party. To show off our pearly teeth we were ushered into the Oral B 'kissing booth' which was invaded with the male models from the Aussie and Herbal Essences speed dating table. After sipping a few champagne cocktails I headed back home, only to be whisked out for a romantic dinner with mr blogmebeautiful. So ladies, what did you get up to? Ahava has recently introduced a new addition to their all-natural My Skin Reborn range, a Facial Mud Exfoliator. Since popping through my letter box I have been using this daily and been quite impressed. The exfoliating granules are gritty enough to brush away any dry dead cells but gentle enough for regular use on even sensitive skin. My skin was left feeling squeaky-clean and cleansed, with non reside left behind after rinsing with warm water. Blemish Balm or BB creams hit my radar last summer after coming over from the Asian market, but only as the leaves started to fall and my summer skin paled and dried out did I start to appreciate their qualities. BB creams act as a moisturiser, primer, concealer and foundation in one but I like to eliminate my winter dry patches so pop my regular moisturiser on first. 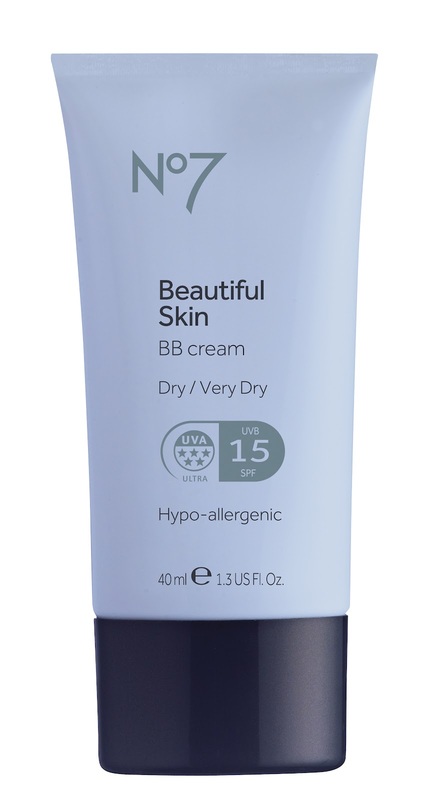 Since I attended No 7's Spring Launch event in October, I have been obsessed with their BB offering. It smooths and perfects skin leaving you with the dewy complication of an undiscovered super model. 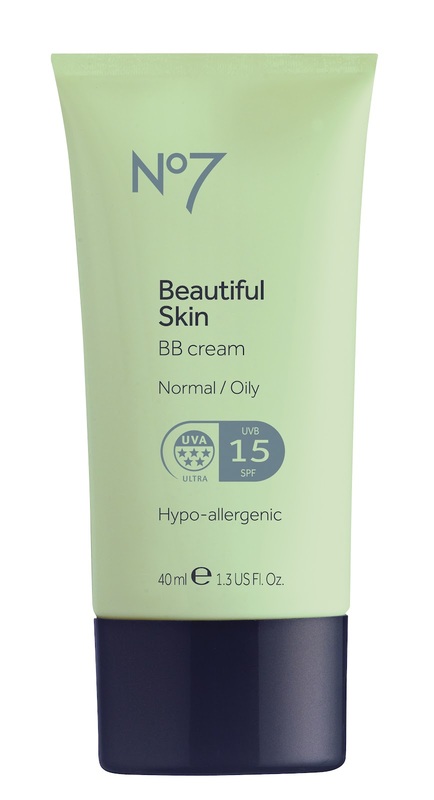 As with all new products from No 7 it comes with SPF15 and 5* UVA protection to keen skin looking its loveliest! (£15/40ml available from Boots which currently have a 3 for 2 offer on all No 7 products) I love the Normal/Dry option of the three avaliable. I love valentines day. Not for any romantic reasons, but to me it signifies that we are halfway through February and winter is coming to a close. Phew. However, if you are looking forward to V day for more obvious reasons, I've put my thinking hat on for what you can spoil your loved one with. Following on in the relaxation theme, why not indulge your valentine to a gorgeous spa treatment. I love massages, but as I can never justify booking one for myself, they are the ultimate treat. Saks Hair and Beauty offer a back massage and mini facial as their 'Saks Boost' £50 and a range of treatments for your man at professional salons nation wide. 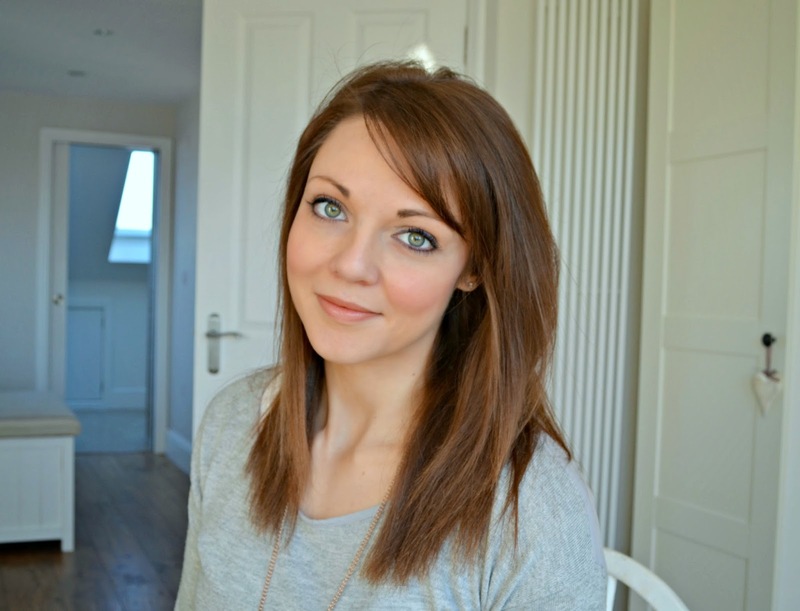 So how am I going to be spoiling Mr blogmebeautiful? 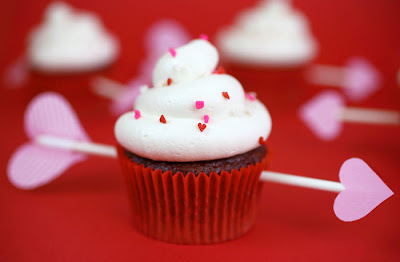 I think I might be following legendary baker, Bakerella and rustling up some of her Cupid's arrow cupcakes. Yum!